The new MacBookPro (recent MacBooks as well ?) laptops come with multi-touch, but for some apps like Safari and Preview it drives me MAD! I accidentally zoom. I've found a way to turn it off! 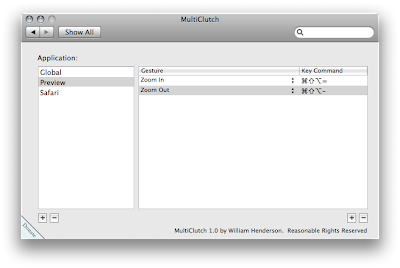 By choosing a key combination that is not in use, multiclutch will get the gesture before the OS, and so will stop working for the gestures you want. In this example setup for Safari and Preview, restart them, and job done!